Be the first to share your favorite memory, photo or story of Berniece. This memorial page is dedicated for family, friends and future generations to celebrate the life of their loved one. FISHERS, IN-Former Alexandria resident Berniece M. (Belmore) Allen, 95, passed into rest with the Lord on Tuesday, February 4, 2019 at Allisonville Meadows in Fishers after an extended illness. She was born on September 8, 1923 in Muskegon, Michigan. Berniece received her elementary education at St. Mary’s School in Alexandria. She was a graduate of Alexandria High School-Class of 1941. In her teen years in Alexandria, Berniece worked at Bailey’s Drug Store and for Dr. Voris McFall for 3 years. Her eagerness to learn and serve gained her much experience at the doctor’s office. The Allen family owned and operated Allen’s Standard Oil in Alexandria at 121 East Washington Street and a Kaiser/Frasier car dealership next to the service station. 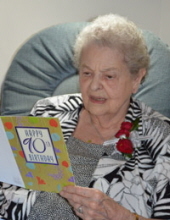 Berniece served as bookkeeper for both businesses from 1938 to 1947. She also worked as a manager and car salesperson. She married Eugene Allen in 1941. Gene and Berniece owned and operated Allen’s Turkey Farm in rural Alexandria from 1951 to 1985. In 1985, they reopened the former White Spot Restaurant in Alexandria as Aunt Ida’s, which they operated until 1991. During all of this time, Berniece had gained a substantial reputation as an antique dealer and appraiser and operated Allen’s Antiques from the 1960’s to the 1980’s. Her beloved Gene passed away unexpectedly in 1997. Always comfortable meeting the public, Berniece embarked on a very successful career in retail furniture sales and held sales positions at Pendleton Furniture, Bullock Furniture and Kittle’s Furniture both in Anderson and Castleton. She also worked and used her knowledge of antiquities as the Inventory Manager for the Madison County Historical Society in Anderson. Berniece was proud to have worked full time and drove herself regularly until she reached the age of 90. She was a devoted member and Past Worthy Matron in the former Alexandria Order of the Eastern Star. In spite of the busyness of her life, Berniece never let that sway her from her commitment to her husband and her sons as a dedicated and loving wife and mother. 4 Grandchildren-Nathan Allen and Matthew Allen both of Frankton, Adrienne Allen and Maxton Allen both of Indianapolis and Former Daughter-in-law-Jennifer Allen- of Indianapolis. The deepest pleasure of her life was in spending time with her grandchildren to whom she was devoted. She had several nieces and nephews. She was preceded in death by her parents, Roy Belmore and Caroline (Meil) Belmore, her husband of 56 years-Eugene “Gene” Allen in 1997, daughter-in-law-Sharon Allen, brother-George Belmore, 2 sisters-Evelyn Shier and Eleanor Broshar. Service honoring Berniece’s life and legacy will take place at 7 pm on Friday, February 8, 2019 in the Owens Funeral Home, 412 North Harrison Street, Alexandria. Roger Brummett, a close friend of the family will officiate. Cremation will follow the services. Friends may call at the Owens Funeral Home after 5 pm on Friday prior to the service. Memorial contributions are suggested to St. Mary’s Catholic Church, 820 West Madison Street, Alexandria, IN 46001 or envelopes will be available at the funeral home. To send flowers or a remembrance gift to the family of Berniece M. (Belmore) Allen, please visit our Tribute Store. "Email Address" would like to share the life celebration of Berniece M. (Belmore) Allen. Click on the "link" to go to share a favorite memory or leave a condolence message for the family.